RTH (Rettungstransporthubschrauber) Eurocopter EC135 T2+ D-HVBE of the Bundespolizei / Bundesminsterium des Innern was photographed at the helipad of the Luftrettungsszentrum Hannover at the parking garage roof of the Medizinische Hochschule Hannover (MHH) in Germany when in service as "Christoph 4". Eurocopter EC135T2+ D-HBVE replaced at that time the EC135 T2+ air rescue helicopter normaly used "Christoph 4". The call sign "Christoph" is used for the German lifeliner helicopters since 1970 and is derived of Saint Christophorus, the Patron Saint for all travellers. The RTH facilities at the the Medizinische Hochschule Hannover (MHH) in Hannover were opened on 2 October 1972. On that day, operations of "Christoph 4" started in the Hannover area as a test with a MBB Bölkow Bo.105 C in yellow 'Katastrophenschutz' colours. Around 1977, the colours 'Katastrophenschutz' helicopters changed to orange. In 1984, the MBB B0.105CBS in service with "Christoph 4" was replaced by a Dornier-Bell UH-1D medical helicopter of the BMI - Bundesministerium des Inneren, o/b Bundesgrenzschutz Fliegerstaffel Nord. In December 1997, the Dornier-Bell UH-1D was replaced by a MBB Bo.105CBS-5. On 1 July 2005, the Bundesgrenzschutz Fliegerstaffel Nord was renamed Bundespolizeifliegerstaffel Nord. In 2007, the MBB BO.105CBS-5 in service as "Christoph 4" was replaced by Eurocopter EC135 T2+ D-HZSD. 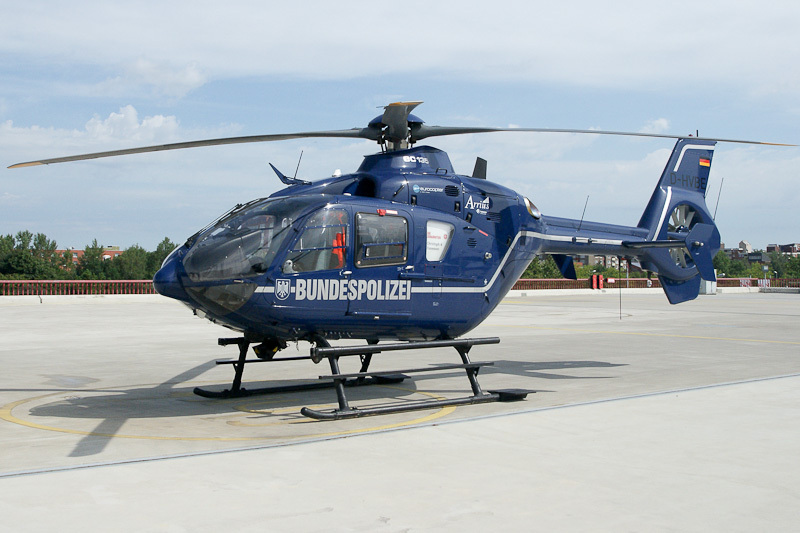 As the MBB BO.105CBS-5, the Eurocopter EC135 T2+ "Christoph 4" is flown by the Bundespolizeifliegerstaffel Nord. Call sign "Christoph" is used for the German lifeliner helicopters since 1970 and is derived of Saint Christophorus, the Patron Saint for all travellers. Eurocopter EC135 T2+ c/n 0152 was original built as an EC135 T1 and registered D-HVBE with Bundesminsterium des Innern o/b Bundesgrenzschutz on 22 February 2001. Early 2002, the aircraft returned to Eurocopter Deutschland for conversion to the Eurocopter EC135 T2 standard. On 9 April 2002, the D-HVBE was registered as an EC135T2. On 1 July 2005, the Bundesgrenzschutz Fliegerstaffel was renamed Bundespolizeifliegerstaffel. In 2010, the helicopter was modified to the EC135 T2+ standard and re-certified on 18 October 2010.